Includes the software tools required to manage most small- to medium-sized districts and non-public schools: student demographics, basic scheduling, attendance, grade reporting (report cards/transcripts), and tuition/fees. Some customers also subscribe to lunch, discipline, and advanced scheduling modules. SchoolInsight was specifically designed to meet the unique needs of small- to medium-sized districts and non-public schools. 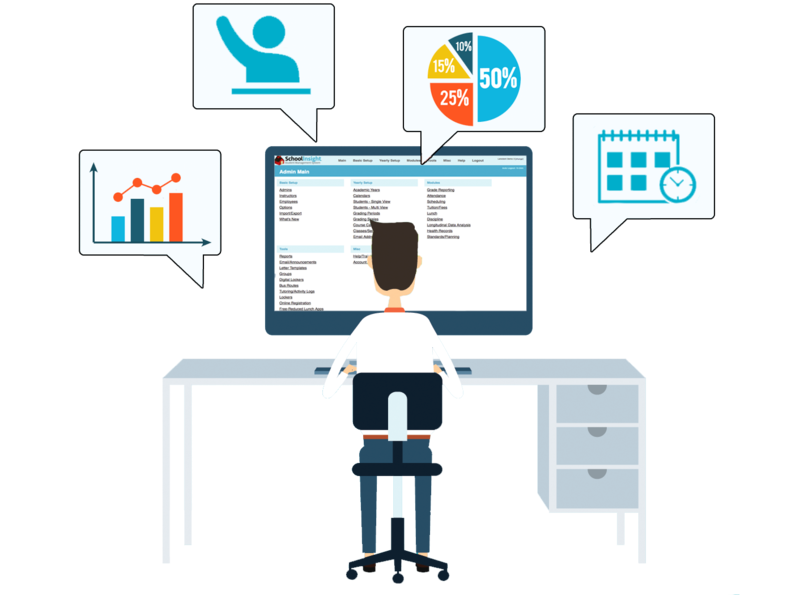 It provides all the functionality to run a typical organization without the complexity and overhead required by large districts. Since data entry is a concern for the office staff, special attention has been paid to allow easy entry and retrieval. Time saved allows office staff to pay more attention to many other important tasks. Since it's designed for smaller organizations, it's very easy to use. We've stripped out large-district features, so it's simple to learn. Users become productive quickly and are very satisfied. Authorized staff (principals, counselors, teachers, etc) can access student data and collaborate on student issues. This frees the office staff from being constantly interrupted for basic student info (phone numbers, parent names, bus route, etc). Since SchoolInsight is a web-based subscription service, there are no large up front costs. The low annual subscription rate fits into the yearly budget. You'll never need to float a bond or run a fundraiser to pay for it. 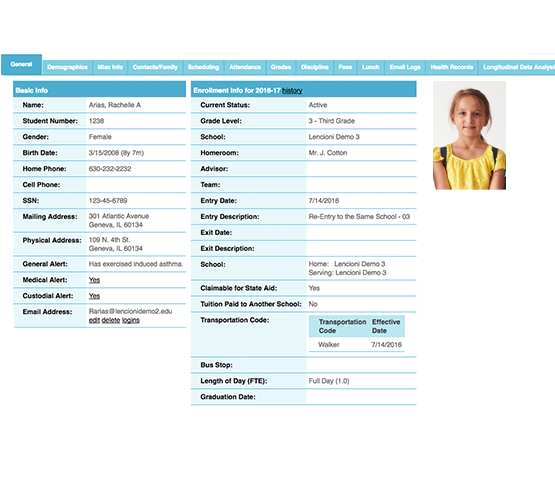 SchoolInsight can generate the wide variety of reports required to run a school. There are also custom reports for generating data unique to your organization. Maintain a vast array of student demographic data, including address, contacts, family, ethnicity, etc. Customize the data for your environment. Register students online in real-time. Manually setup the master schedule, enroll students in classes, and print student schedules/class rosters. A simple and easy approach to scheduling — an electronic version of the magnetic scheduling whiteboard. Good for self-contained/elementary schools or schools with one class per grade level. Keep student grades to easily generate report cards and transcripts. Supports traditional and standards-based grading, custom grading scales, gpa calculation, and so much more. See TeacherEase report cards for more information. Cut down on bookkeeping tasks. Parents log in to see how much they owe for registration, books, PE clothing, field trips, etc. Run reports, send letters/emails home, and find students below account balance thresholds. Run 'paperless' attendance by tracking period and daily attendance. Customize attendance codes and track attendance to the minute. Generate overall summary reports and various breakdowns. Notify parents concerning truancy. Save teachers' time by accessing student data on-line. They won't run to the office each time they need a parent phone number, bus route, emergency contact list, etc. Use templates to generate letters and emails for parents. Create general messages (notification of 8th grade field trip) or messages for specific circumstances (account balance low, truancy warning letter, discipline notification, etc.). We love SchoolInsight. The learning curve is refreshingly low. The data is very secure and the tech support is first-rate. The bottom line is that it's worth every penny. 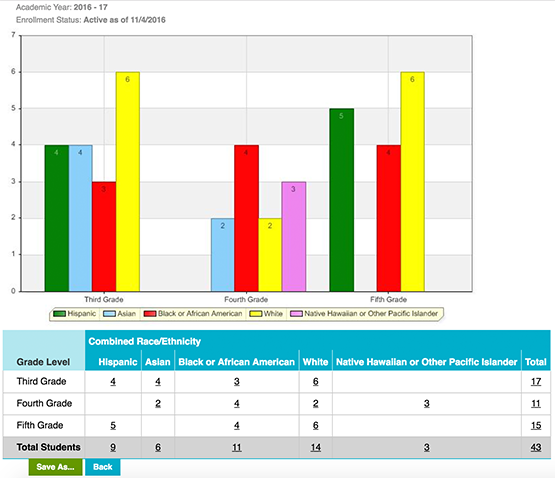 SchoolInsight has made a major difference in the way we collect grades, attendance, and other key data for reports. We're saving time in the classroom and in the front office, getting parents more involved, and helping our students better prepare for the state tests. We love it and it is a lot less expensive than any of the other options we looked at!